Xiao He and Buyi Headline this first night of indie Music celebration alongside Zhang Qianqian, Po Shang Cun, and Guo Nian. It’s definitely the folky part of this shindig with some bands that have “indie” written all over them. Sure, Xiao He is signed to maybe mars but the others as far as I know have been doing things on their own for quite some time now and that’s what indie really means: independent. A must go to gig… seriously worth the cash. They came before and put on one hell of a good show at Mao. I liked the costumes and the style they brought along with that eclectic mix of genres in their song. A little metal, a little hard rock with a side of pop, maybe even some rapping here and there. A good band for a good time. I’m not sure i’d say the same for the opening act but let’s stay open-minded, shall we? The march edition of the Book Swap and Board Games meeting takes place from 2 to 6 pm at Brussels Bar. This one is a special 2 for 1 edition so bring in a few books and take a whole lot more home with you. Of course, games galore are available so play around. the drive-in is back in business after their yearly hibernation and kicking things off with a reggae night. They actually had a little experimental thing last saturday but this one is the opening night. A good time to go and hang out with the friends, listen to some tunes and just have a 2 kolegas kinda night. Don’t expect to do anything early on Sunday… not this weekend. One of my resolutions this year is to make it more often to the old what. I love the place, I love the owners and I love relaxing there. It’s like a miniature 2 Kolegas stuck between Zhongnanhai and the Forbidden City. The Last 3 Minutes have been making a bit of noise lately and a few people have been positively impressed by them. I have yet to catch them but this might be the right night if i can pull off an old fashioned 2 stop night. 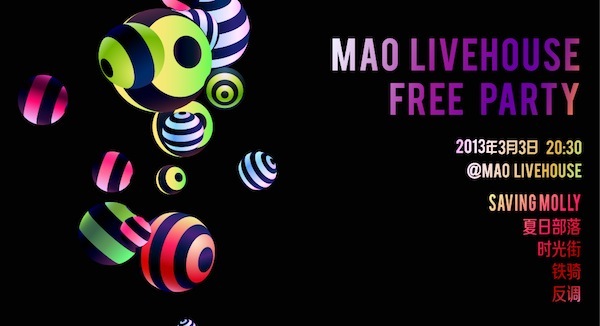 Tenger Cavalry, Summer Tribe and Saving Molly are just some of the bands scheduled to play sunday night for free at Mao Live. It’s a nice little way to unwind and catch some decent music, meet the bands and have fun. 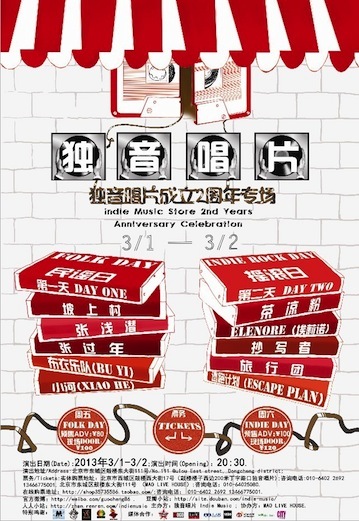 I like that Mao is holding these parties to encourage attendance.. i just hope they are actually paying the bands some. Still, it’s worth catching this one for Tenger Cavalry if nothing else. They’re getting some incredibly good coverage in the metal magazines overseas for a good reason. them cats are doing some awesome Dark Pagan Mongol Folk Metal. yes, it does sound as it reads. both bands are opening i believe… definitely will be a weird mix! Tengger Cavalry! they were awesome. They’re playing next at Strawberry Fest on May 1, says lead singer.